← Killed For Wearing Hijaab??? It is difficult to say who is the main protagonist of The Forty Rules of Love by Turkish author Elif Shafak. It is equally difficult to decide which century should we choose the protagonist from —the 13th or the 21st. Such is the fluidity and exuberance with which Shafak has written this popular fictional. Ella Rubenstein is forty, Jewish, unhappily married, and has forgotten who she is, revolving her life around her infidel husband and children. As part of the work she is doing for a literary agent, she comes across the manuscript of a novel called “Sweet Blasphemy” which mesmerises her in how it revolves around the relationship between 12th century Islamic theologian-scholar turned poet Mevlana Jalaluddin Rumi and the mystic Sufi Shams of Tabriz who is Rumi’s spiritual master. This is a turning point in Ella’s life, who is inspired by Shams’s life-altering forty rules of love that ultimately aim at helping people achieve communion with the Absolute, the Creator, through the path of love, and in so doing learning the answers to the deepest questions of life that would in turn help transform a person’s conduct and behaviour towards other creatures in a beautiful manner. This was what Shams was teaching Rumi. This is what, indirectly, the writer of “Sweet Blaspehmy”, Aziz Zahara, teaches Ella, forever changing her life. Aziz does to Ella what Shams did to Rumi – he becomes her mirror in which she sees her real self. He is the stone that flings itself into the stagnant waters of Ella’s uneventful, complacent, almost dead life, and causes a ripple effect that brings to the surface everything she truly is and is meant to be. Thus, she discovers love. Shams of Tabriz was an Iranian Sufi mystic, a wandering dervish, responsible for initiating Rumi into Islamic mysticism. Rumi’s poetry has immortalised Shams, who is said to have been the reason Rumi evolved from a scholar used to the Aristotelian style of questioning and scholarship in faith, and became a love-poet, whom Shams brought to the path of a direct and ecstatic connection with God. The word “Shams” literally means the Sun in Arabic. While the beauty of Rumi’s poetry continues to be celebrated world over, Rumi can be compared to the moon who actually reflected the resplendent light of the sun, by passing on the message he learnt from his spiritual master, Shams. Shafak’s ingenious technique of usage of the literary device where each chapter is named after the character, whose inner soliloquies comprise that chapter, makes it very believable and relatable. An essential part of Rumi’s poetry, of Sufism, and in turn of Shafak’s book, is about empathy, in which you understand the other’s perspective. Through the different voices in the book talking in first person, in an almost “stream of consciousness” narrative technique because they are so intimately monologue-like, Shafak has achieved the objective of keeping empathy as one of the central threads that keep stringed together the many themes in the book. The message of empathy and understanding different perspectives is spell-binding in the book. We look at the world not just through the eyes of Ella and Aziz, and Shams and Rumi, but also characters like Desert Rose the Harlot, Sultan Walad (the son of Rumi), Suleiman the Drunkard and even The Killer who is hired to kill Shams. As a writer Shafak is capable of using much more intricate phraseology and vocabulary, but it seems as if she on purpose keeps the choice of words and the tone very simplistic and basic, as if she is afraid of diluting the basic strength of the profound message of the book through unsolicited use of jargon. The fact that the novel catapults the reader from past into the present and vice versa, from the world of Shams of Tabriz in 13th century Konya to the world of Ella Rubenstein in 21st century New Jersey, is deeply symbolic. The fluidity with which this has been done gives the novel as surreal timeless quality, where even the characters from the 13th century seem relatable today. This is where Shafak is truly brilliant, for this is an underlying message that Rumi and Tabriz’s message of love is not and cannot be limited within encapsulations of time and space. To understand this further, we have to take a look at Rumi’s position over the centuries. His funeral it is said, was a historic event in that it extended over forty days of grieving, where he was mourned by Muslims, Christians, Jews, Greeks, Arabs and Persians. Rumi, himself, it is said, married both a woman of Islam and a woman who was originally a Christian. In the present day context, Rumi is prided over by Muslims who see him both as a commentator of the Quran and a scholar (especially his life pre-Shams), as well as a proponent of the universality of the message of Sufism. But what is doubly interesting is how Rumi has managed to be celebrated even by the West, thereby bridging many of the gaps between the East and the West centuries after he died. He has influenced the writings and philosophy of the likes of Ralph Waldo Emerson and Georg Wilhelm Friedrich Hegel. Recent years have seen an upsurge in Rumi’s popularity in the West. According to the Christian Science Monitor, Rumi got ranking as America’s best-selling poet in 1997. Rumi-following and coffee table books boasting a dabbling with the message of Rumi are quite the fad. In a world where the mantra “I am spiritual, not religious” has gained momentum, Rumi is one person the past, present and probably the future, and both the East and the West, agree upon. 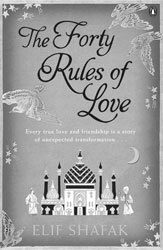 The Forty Rules of Love has been hugely successful. It sold more than 600 000 copies, becoming an all time best-seller in Turkey and in France awarded with the Prix ALEF – Mention Spéciale Littérature Etrangère. While there is no doubt in the lyrical beauty of Shafak’s work, part of the reason for the success of this book lies in the fact that in the world that we live in today, you cannot go wrong with Rumi and Sufism. Posted in Of Books & Literature and tagged 40 Rules of Love, Elif Shafak, Rumi, Shams of Tabriz. Bookmark the permalink. brilliant review farah, must read it now!! Great job. Have not read the book yet but will soon. Great work on the review. I just hopped over from TRA on FB to read this. Hope to read more of your work in future. Thank you for this review. Its been two weeks since I have read the book and im still reeling from the power of the words. Its not a novel you read once, its a novel you keep referring to time and time again. I never knew reading a book like this can make me feel so eager & enthusiastic 2 read more.. Secondly as it is based on our Islamic teaching it is so comforting to know tht just by surrendering to Allah, can make our life so peaceful.. Just amazing, cant wait 2 finish it.